The RentalWIZ program is meant to be used in conjunction with the Tenant File. 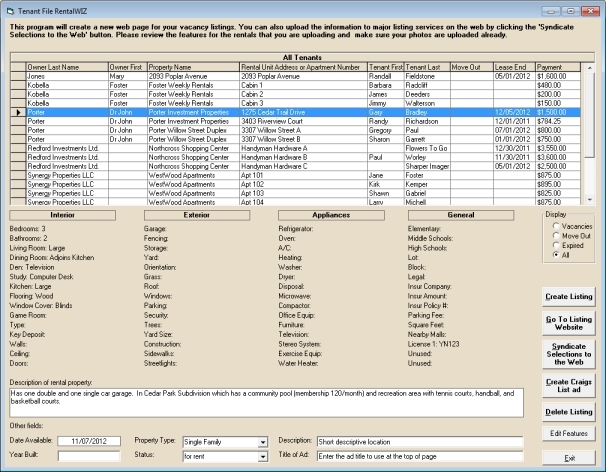 All of the information and details of the rental properties you manage with the Tenant File is used by the RentalWIZ software. Primarily, the 'Features' section of the Tenant File, which contains Interior and Exterior features plus the images and photos linked to each rental unit, is the main source of information. However, if you have not already completed that information or linked photos to your rentals, you can still do that within the RentalWIZ software. To get started, you first need to set up an account for the RentalWIZ service. After that, you will then be able to download the RentalWIZ software from the Internet. It is a small file that will install quickly on your computer. It must be installed into the same folder as your Tenant File software. When your account is set up, you will have an 'Account ID' to enter into the RentalWIZ software. Additionally, if you have the enhanced version of the RentalWIZ program, you'll be given a special code to type into the following screen. The 'basic' free version allows 1 photo, a maximum of 3 concurrent listings, and does not include the flyer creation feature. This is the Account Information screen. Simply enter the Account ID assigned to you, and fill in the rest of the information. Your Account ID will be part of the URL for your free web page on the 'Rental Homes Available' website. Much of this information will be made public on your web page, so be sure to use the phone numbers and email address you want to give your prospective tenants. Same with the address, make sure it is the mailing address that you would want your prospective tenants to contact. If you have a company logo on your website, provide the URL for that logo. You can find the URL by going to your website, right-clicking on the image, and copying the image URL. The 'Default Ad Title' will show up on each listing and is basically a short descriptive line that describes ALL of your properties. Be sure to use any 'keywords' in this line that will help search engines find your web page easily. The 'Descriptive Location' will only show up at the top of each web page directly under the heading 'Property Listings'. This is an important place to use keywords, such as the general area of your listings. An example would be 'Homes for rent in Austin Texas', 'Townhomes in the Greater Houston area', or 'Beautiful Vacation Condos in Destin Beach'. If you have not already linked your photos in the main Tenant File software (in the Features section) you can still do it here. If the photo is already in the Tenant File software, you can skip this step. This will find a photo anywhere on your computer, link it to a specific rental unit, and then copy it to the Tenant File folder under the 'Graphics' folder. Your original photo will not be affected. Be sure that you upload at least 5 photos for each rental if you are going to create a flyer. You will only need one for the web page ad. We suggest that you have a photo of the entire house, the living room, the kitchen, a bedroom, and an exterior photo at the minimum. Just follow the simple directions on the screen and you will have your images ready for the RentalWIZ service in a short time. 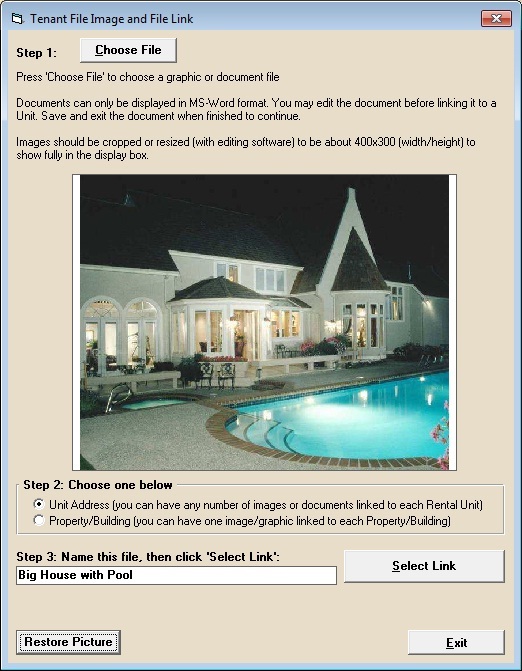 Step 1: Click 'Choose File' and browse to any graphic image (jpg, gif or bmp) on your computer. Step 3: Name the file. Choose a short name that is descriptive of the photo itself. Don't include the rental address or any characters other than alphabet letters or numbers. Now, click the 'Select Link' button to choose which rental unit this photo is to be linked to. That's it, now the photo is linked to the Tenant File. The next step will be to upload the photo to the RentalWIZ website. 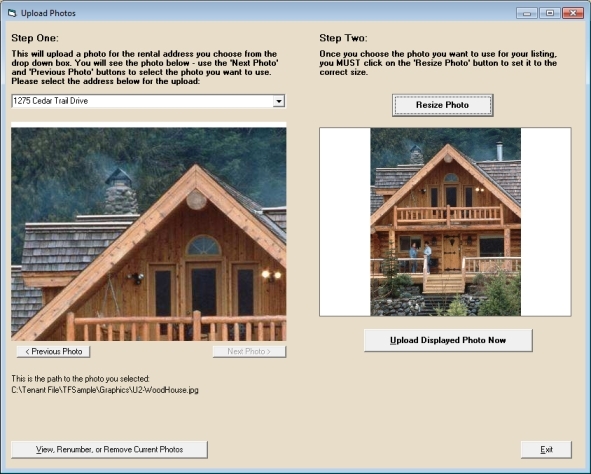 Now that the photos are in the RentalWIZ program on your local computer, you need to upload them to your web page. Step One: Just click the down arrow and choose the rental unit address for this photo. Step Two: If the displayed photo in the large box to the right is not the right photo, use the '< Previous Photo' or the 'Next Photo >' button to browse to the right photo. Now, click the 'Resize Photo' button, then click the 'Upload Displayed Photo Now' button to make the transfer. You really only need to upload the photos for the units that you will be selecting to rent or sell in the next step. This is where you decide which rentals to upload, and enter any additional information. First, take a look at the 'Display' option button on the right. 1. Vacancies: this will display a list of all the currently VACANT units in the Tenant File program. 2. Move Out: this will display a list of all tenants that are going to move out by a specific date. You will be shown a field where you can enter that date. The 'Move Out' information is taken from the 'Move Out' date that is in the Tenant File software. 3. Expired: this will display a list of all tenant with leases that are or will be expiring as of a specific date. You will be show a field where you can enter that specific lease expiration date. 4. All: this will display all tenants so that you can pick from the entire list of your rental properties. Next, you will click on one or more rows on the grid at the top. To select one row: Click the small button to the left of the Owner Last Name. To select multiple rows: Hold down your Ctrl key (on your keyboard) while clicking on a row. To select a group of rows: Select a single row, hold down your Shift key (on your keyboard), the select the last row with your mouse. 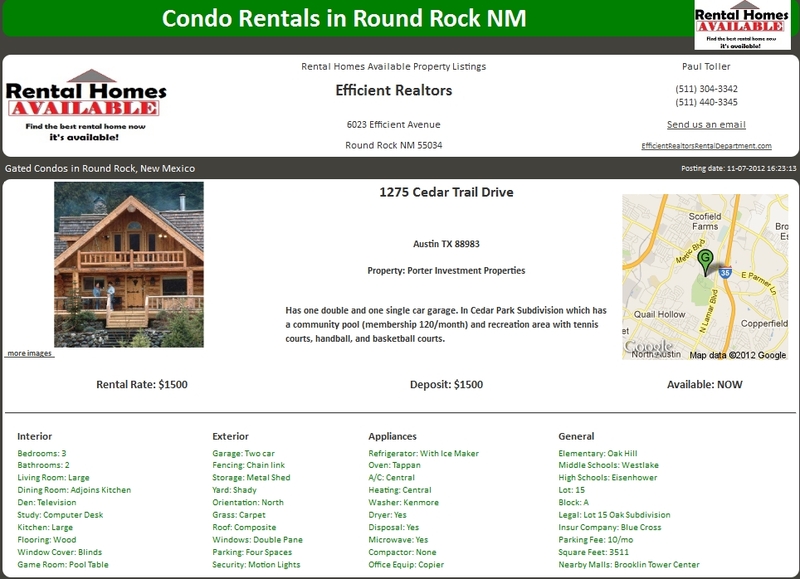 As you click on each single rental address, you will see the Features that are set up for that particular rental unit. If you need to edit or add more 'features', you can click on the 'Edit Features' button and work on the selected unit. The 'Description' field (which comes from 'Features' also, is very important and is prominently displayed on your web page. At the bottom of the screen, be sure to make entries that apply to all rental units. You can use the 'Year Built' field if you are only uploading a specific rental address, otherwise leave it blank. However, make sure you select the 'Property Type' and 'Status' for the rentals you are uploading. Once everything is OK, just click on the 'Create Listing' button, which will upload all the information to your web page instantly. (Make absolutely sure that you are already connected to the Internet before clicking the button). Then to see the listing you just created, click the 'Go to Listing Website'. If anything does not look right you can make the changes and upload the information again. Note: Each time you use 'Create Listing' it will overwrite (not 'add to') the previous listing. So be sure you upload all of your listings at once. When the listing looks good on the website, click on the 'Syndicate Selections to the Web', which will upload the same information to the syndicated search engines, such as Google Base and Zillow. Note: You must create your listing and syndicate to the web in the same session, because your selections and some settings on this screen are not saved. If you exit, you will have to set up the choices again. Create Craigslist Ad: This will create the HTML code that you can paste into your Craigslist ad. You will need to follow the steps on Craigslist to create a new ad, then paste the code provided into the 'description' part of the ad. Your add will look like your web page listing. This is a sample of the listing that will appear on your own web page. There is no limit to the number of listings you can have. You can link to this page from your own website, emails, or blogs. You company logo can be inserted at the top left and your company information is on the top right. This is also the same ad that will appear in your Craigslist ad by simply 'pasting' the RentalWIZ generated code into the ad. 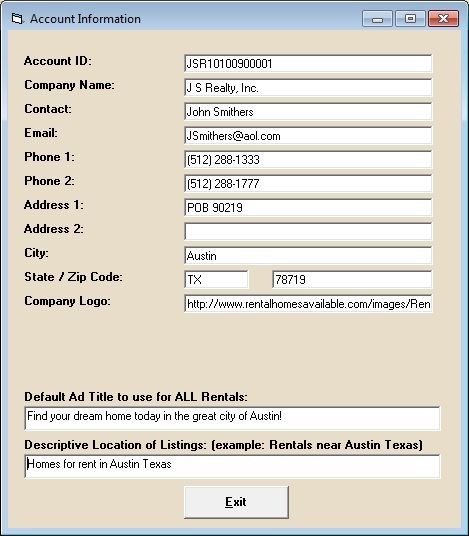 Creating a flyer is very easy, because all of the information has already been entered into the Tenant File or the RentalWIZ software. All you have to do is to choose the photos. You don't have to have 4 photos, but that will leave a blank area on your flyer. Simply, choose the rental unit address and the available photos will be displayed. Then select the photo position in one of the drop down boxes below the desired photo. If you want to start over, just clear one or more of the photos by using the 'Clear Pictures' selection. When you are ready, click on the 'Create New Flyer Now' button and your flyer will be created. To see your current flyer, click the 'Show Current Flyer' button. To print the flyer, click the 'Print Current Flyer' button. This flyer is in HTML format, so you can upload it to the Internet for display if desired. 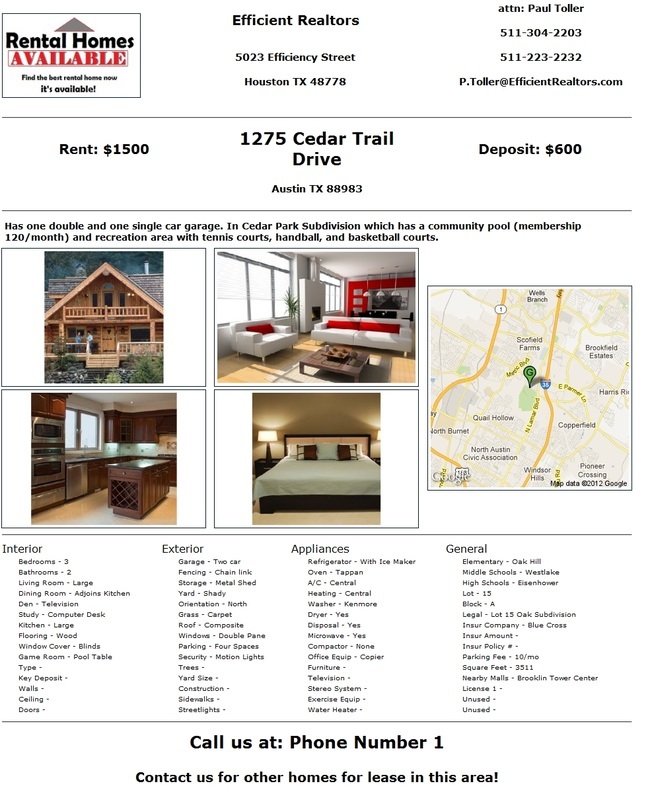 Here is a sample of the RentalWIZ flyer that is created. You can use this flyer in your advertising. Since it is created using HTML code, you can upload it to the Internet as well. The possibilities for it's use are unlimited and you are free to use it however you wish. 1. Make sure you complete all of the account information. This is important contact info that will show in your listing, such as your company name, email address, and phone numbers. 4. The first thing the visitor notices are the photos (images). Make sure that you use 2 good photos if possible, and that they show 2 different selling points that the renter will be most interested in, such as the front exterior, and maybe the kitchen or dining area. 5. Sometimes overlooked is one of the most important selling points - the detailed description of the rental. This is entered under 'Features' in the Tenant File in the upper right corner (it can also be added in the RentalWIZ program, too). You have a great opportunity to go into detail answering the questions that you'll have to answer anyway when they call you. This includes using compelling words such as 'beautiful', 'lovely', 'spacious', and 'roomy'. Talk in detail about the property, such as amenities, exterior features, the schools and shopping, fencing, security, and more. Even though amenities are 'listing' at the bottom of the ad, here is your chance to elaborate. Don't forget SEO here, either, so be sure to add keywords like the city, state, region, suburb, furnished or not, number of stories, and other keywords the 'searcher' might type. For example, if they type 'one story furnished rental near Katy TX' your listing will be found, if you have good SEO using those keywords. This is extremely important, so don't skip this step! Thank you for using the RentalWIZ service!